Honestly, I was pretty excited about this trip because I heard a lot of good things about the place. Including the fact that it is easily accessible to everyone and it has an easy way to climb here without any hiking experience. 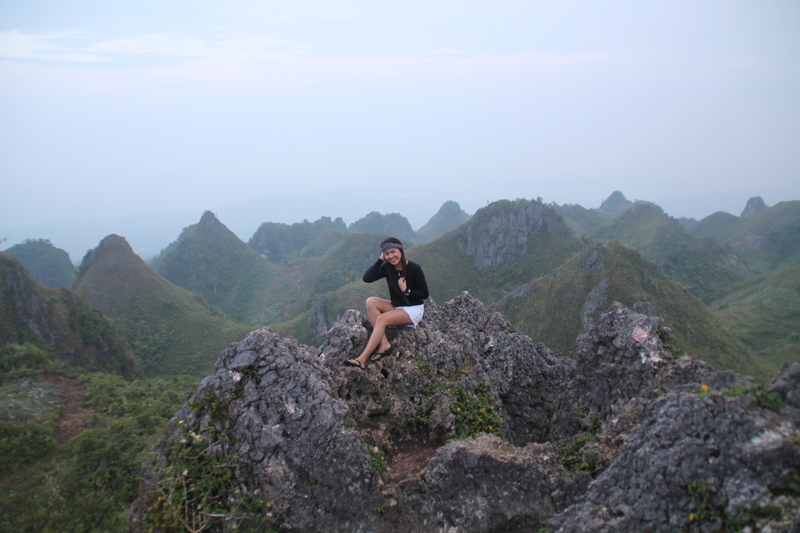 Though I wanted to stay and have an overnight here, I’m still satisfied with my experience visiting Osmeña Peak. It was 2:30am, I’m on the road with new friends. They were all Ilongos. We’re on a nearly 2 hour trip to Mantalugon, Dalaguete. We’re about to climb a peak that is approximately 1000 meters above the sea level. The highest in Cebu, located between Dalaguete and Badian. It is called Osmeña Peak or Opeak for short. We rented a Van, which is big enough for the seven of us, while on our way we ate our super-duper early breakfast. We slept our asses off, and then that nearly two-hour trip ended, and then tadaaa….Hello Dalaguete! It was still dark when we started climbing. And, it was my first time hiking without seeing any view. It was more tiring actually, though the climb was less than half hour. The view of nature can boost my energy and trekking without any weakens me. HAHA. Anyway, it was nice because we were the first one to reach the top. The sun was just about to shine, though the sunrise was not that visible because it was foggy. Still, we enjoyed the view and we had some Instagram moments. We also went to the near peak with the white flag. It was higher and steeper than Opeak. So if you come and visit, make sure to drop by. And be careful! Going down was quite nice because I saw the beauty of Osmena Peak. If you ask me what it was like? It was like walking in the park. I remember that scene in the movie P.S I love you when that moment where the girl was lost and trying to find the national park for hours, and then she met the boy, and told her that she’s probably in the national park for a few hours already. Remember that scenario? Come on people! You should watch the movie! 😀 Anyway, back to Opeak! From Cebu South Bus Terminal – Ride a bus going to Oslob (Any destiantion that passes Dalaguete) Php100.00-120.00. Dropped at Dalaguete conjunction. Rent a motorcycle going to Osmena Peak jump off for Php100.00 per person. At the jump off, you can hire a guide, mostly they are kids. Give a reasonable price, Php100 .00 is enough. After the climb, we have to take our lunch. Jessie, our driver, was very hospitable. He took us to his parents’ house since we can’t decide where to eat. We stayed there for a meal, we watched TV and even slept! Come on! 2:30am is too early for a sleepyhead like me. We were all tired and a quick nap is all we needed. After our siesta, we passed by an old church in Boljoon, The Church of Patrocinio de Maria. We ended this trip chilling at the beach. Playing some games that made me us tipsy. HAHA. What I love about having this fickle feet is that I gained not just memorable experience but also friendships. Thank you Ilongos for tagging me along on this trip. Here’s to more adventures together! P.S. Please speak cebuano on our next adventure. HAHAHA.